A winner’s medal from the 1919 ‘Royal Henley Peace Regatta’. 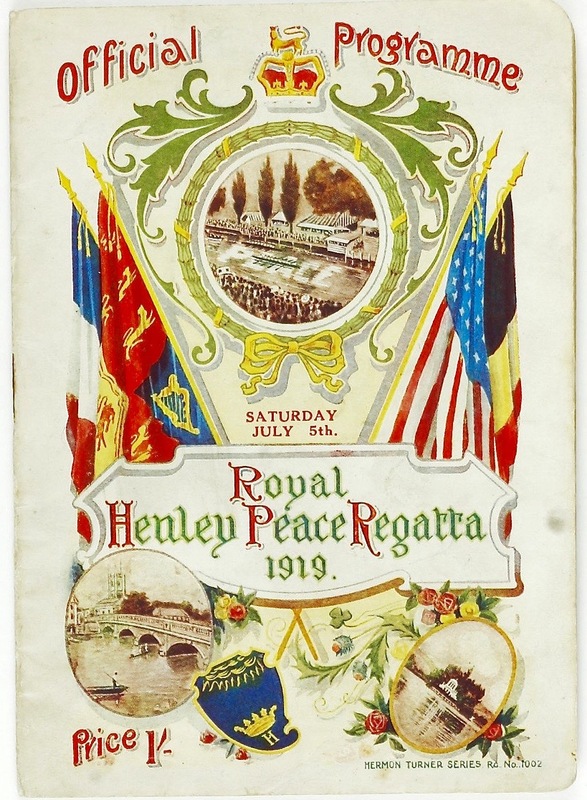 The final day programme cover for the 1919 Royal Henley Peace Regatta. An ‘old and new’ composite picture from @1919HenleyPeace showing the 1919 Australian Imperial Force (AIF) Number 1 Crew – and also how little things seem to change at Henley. Pages from the Friday programme of the 1919 Regatta. Chris Hartley, who has been coordinating the international participation, said: “The 2019 King’s Cup campaign has been several years in the making and has strong support from all eight nations. It once again demonstrates the power of sport to build positive change. As military forces around the world embrace gender inclusiveness, the prospect of mixed crews racing at the Regatta is tremendously exciting. As in 1919, the Regatta is breaking new ground and we anticipate highly competitive racing”. The AIF Crew that won the original King’s Cup in 1919. 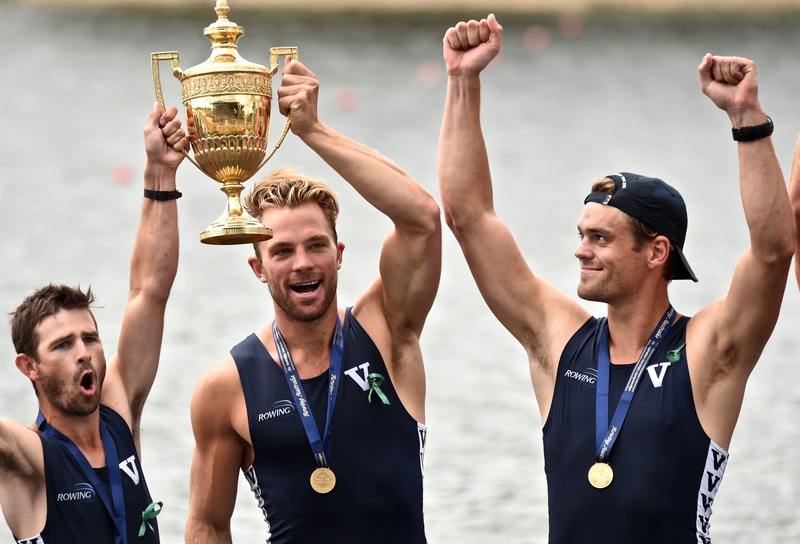 The Rowing New South Wales website has a nice history of the Interstate Eight-Oared Championship, later renamed The King’s Cup. 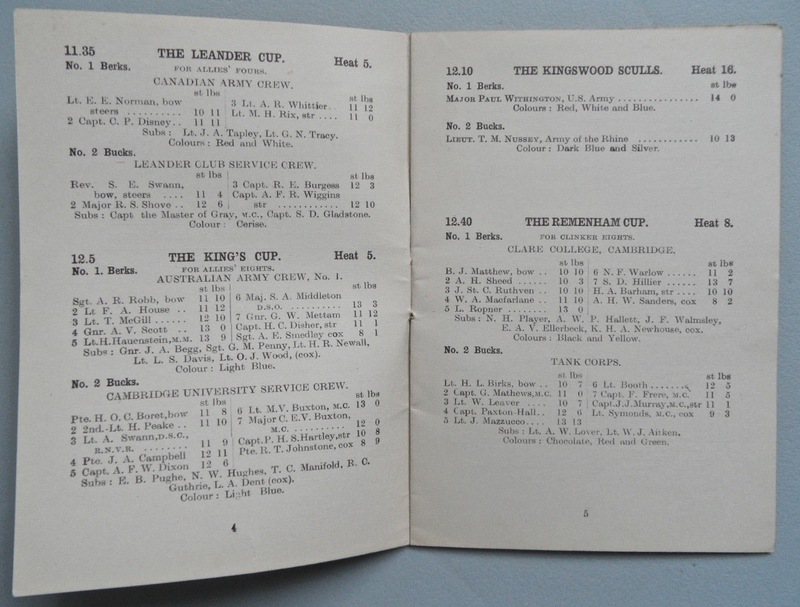 The significance of the King’s Cup in Australian rowing cannot be underestimated nor can the importance of the story of how the trophy was won by a group of battle-hardened soldiers at the end of WWI. The Interstate Championships continue to be the most loved regatta in Australia and the King’s Cup the most revered trophy. The King’s Cup story is also an important part of Australian history. It highlights the bravery of our soldier rowers who saw action in some of the worst battles of WWI. It demonstrates their ready resumption back to the joy and honour of sport. It describes the successful battle with wartime officials who confiscated the Peace Cup as a ‘war trophy’ for display in a museum. But most importantly, it illustrates the winning of The Peace. The unsettling adjustment back to civilian life after the atrocities of war. The rehabilitation through sport of the physical wounds of war, but more so, the role of sport in the recovery from the severe psychological scars of war. A plaque sited at the Sydney International Regatta Centre, Penrith, giving a brief history of the King’s Cup. Not only will there be a book on the events of 1919, Scott Patterson and Andrew Guerin of New South Wales based Slamcam Films are producing a documentary, The Oarsmen. I have witnessed the large amount of work that they are putting into this and am looking forward to the end result. The project has a very interesting Facebook page, notably the photo and video sections. 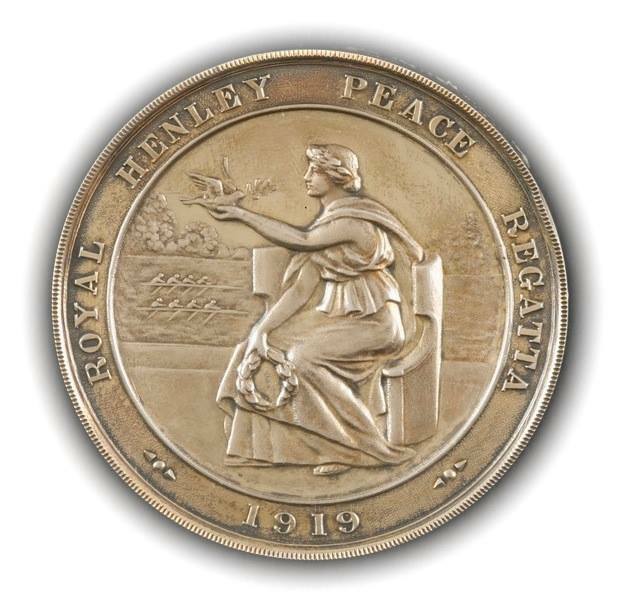 There is also a Twitter feed, @1919HenleyPeace. 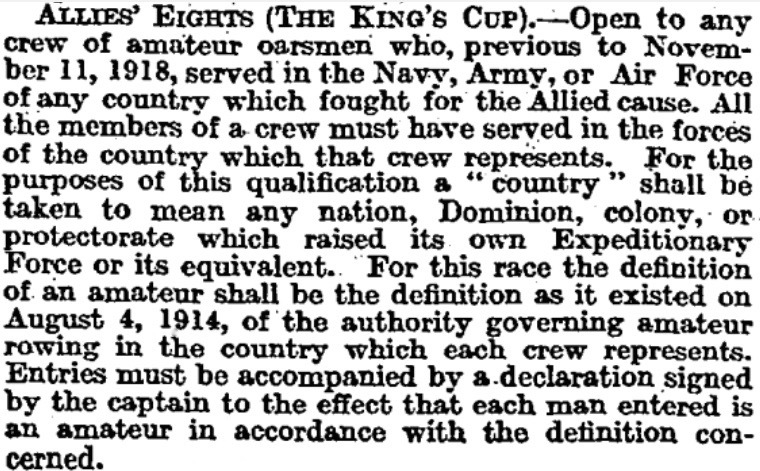 “The Times” report on the entry qualifications for the “Allies’ Eights’’. The fanatical devotion to ‘amateurism’ was maintained, even though the ‘mechanics, artisans and labourers’ thus excluded from the King’s Cup had been allowed to potentially die for the King during the War. New Zealand is planning to make a major contribution to the Peace Regatta Centenary with the 1919 Army Eight Project. Remarkably, the eight used by the Kiwi forces at the Peace Regatta is still in existence in New Zealand. It was built by Sims of Putney in two-and-a-half days in January 1919, used at Henley, taken the eleven-and-a-half thousand miles home by its crew and used by the Union Boat Club on the Whanganui River until the 1960s. It was originally hoped that the restored boat would be taken to Henley, but I can find no indication that this will now happen. 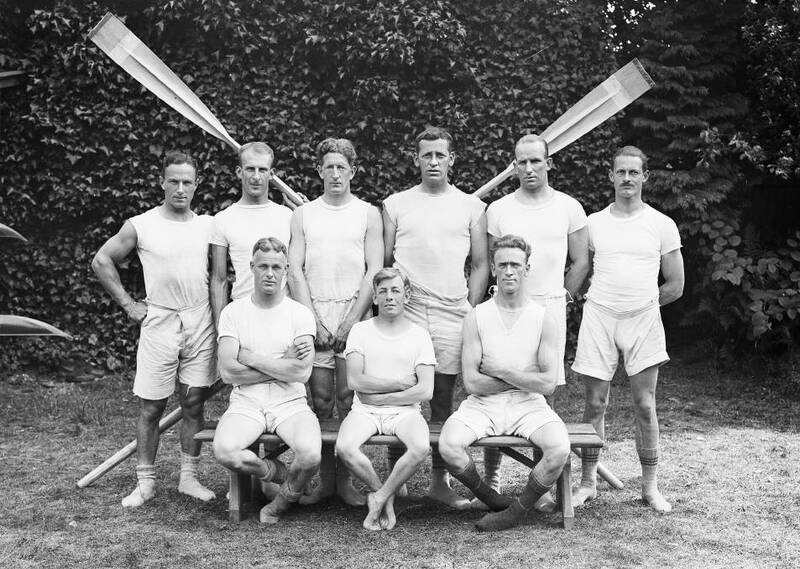 Newsreel of New Zealand’s Peace Regatta crew training at Putney in 1919 is on YouTube. 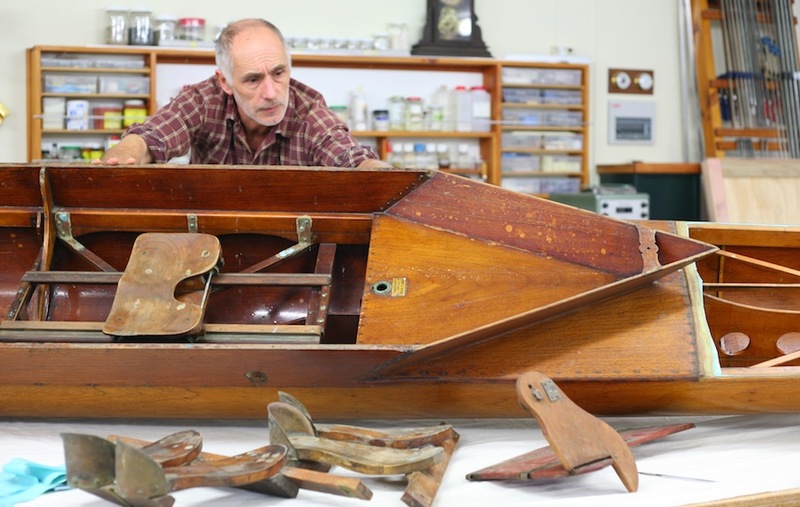 Aaron Roberts, boat builder and restorer on the team of Manawatu Museum Services, working on the ‘Army Eight’. A November 2018 newspaper report in the “Whanganui Chronicle” said that the restored boat will be ‘viewable but not rowable’. As the pictures below illustrate, there were numerous other smaller ‘Peace’ and ‘Victory’ Regattas in 1919 as people desperately tried to return to normalcy after four years of war. 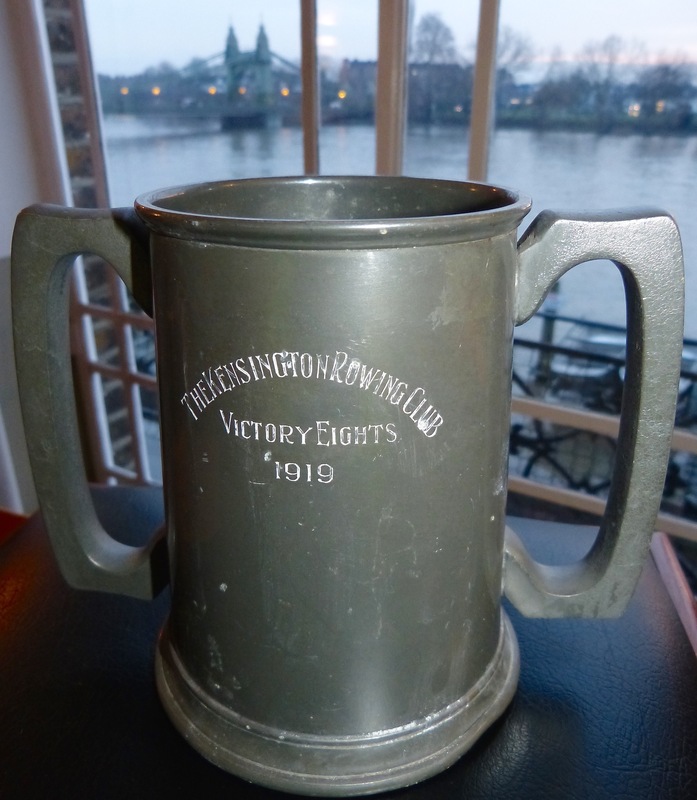 A prize from west London’s Kensington Rowing Club Victory Regatta of 1919. 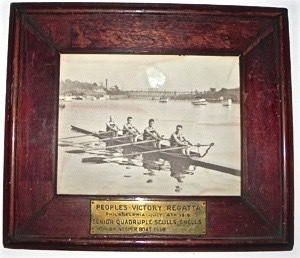 The plaque on this American picture reads ‘People’s Victory Regatta’ / Philadelphia July 4th 1919 / Senior Quadruple Sculls Shells / Won by Vesper Boat Club. 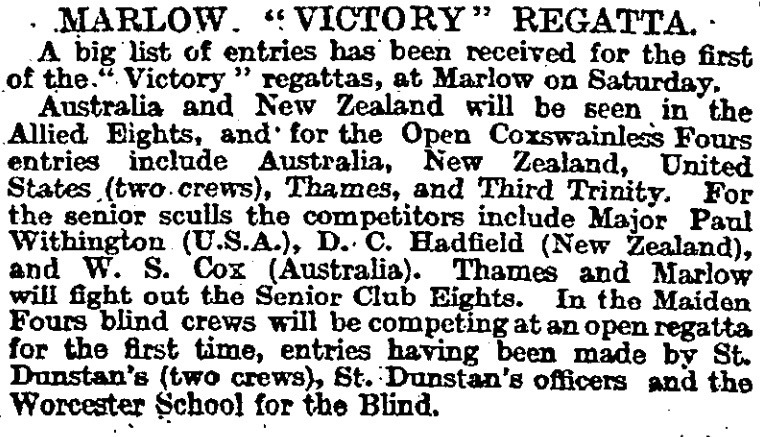 A “Times” newspaper report on entries for the Marlow (near Henley) Victory Regatta of 21 June 1919, a good ‘warm-up’ for Henley. 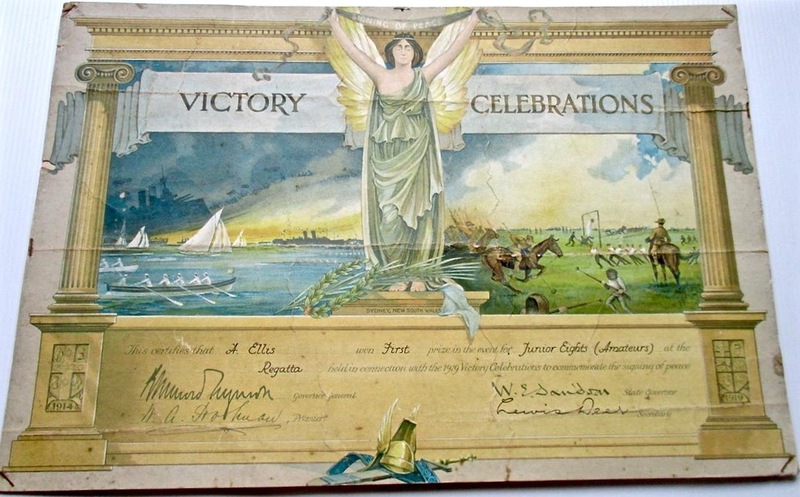 A winner’s certificate for the regatta held as part of the victory celebrations in Sydney, Australia, in 1919. 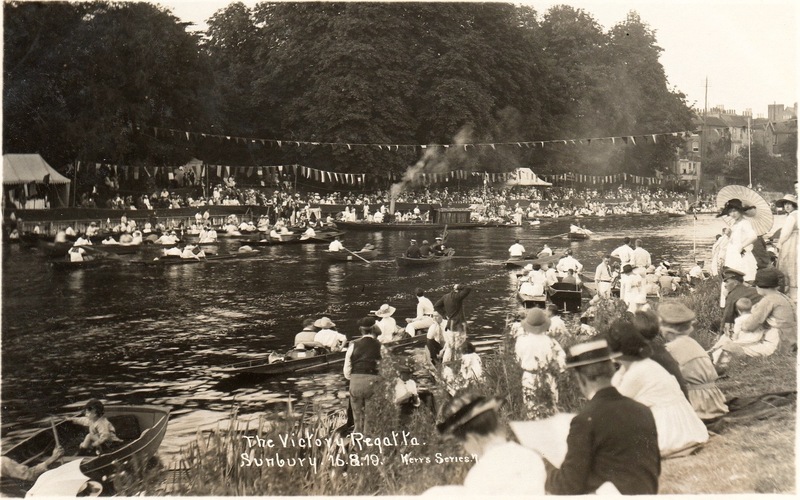 A postcard showing the Victory Regatta held at Sunbury-on-Thames, south-west London, on 16 August 1919. 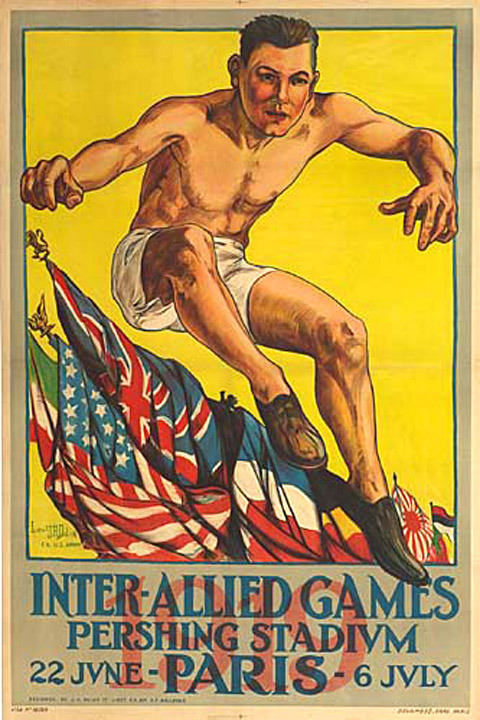 A poster for the 1919 Inter-Allied Games held in Paris. The Inter-Allied Regatta was held on the Seine on July 17 and 18, twelve days after the Henley Peace Regatta. 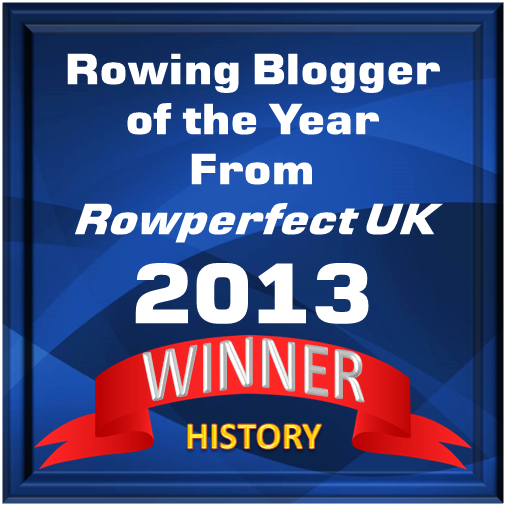 There were three events: eights, coxed fours and single sculls. Unlike Henley, the American organised regatta was a purely military event, and it allowed ‘professionals’ and ‘amateurs’ to compete together. 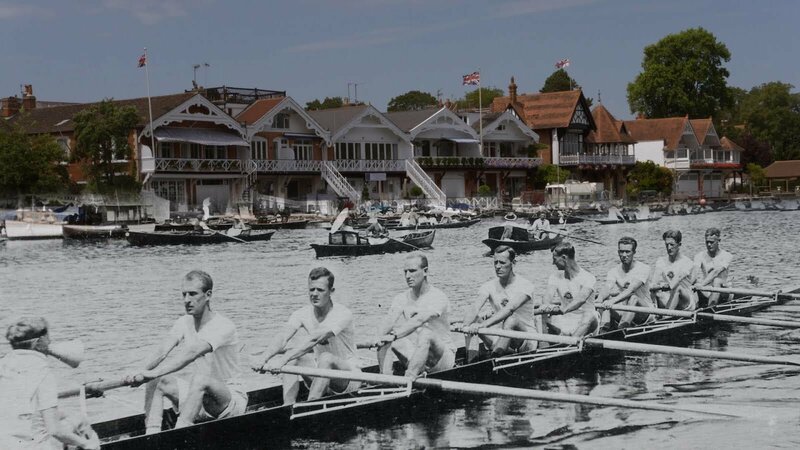 The 2019 Henley Royal Regatta runs from 3 to 7 July with events in the new King’s Cup from 5 to – 7 July.